Stephanie Poggi is the executive director of the National Network of Abortion Funds and the co-chair of the All* Above All campaign. 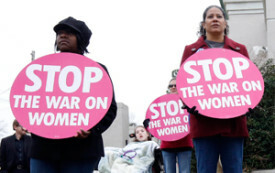 The End of Abortion Funding Restrictions? Thirty-seven years after Congress first ended Medicaid funding of abortion, a new coalition of abortion rights and reproductive justice groups is poised to fight back.